posted: May 01, 2015 by: Franklin Falls Animal Clinic Tags: "Clinic Specials" "News"
The first four months of life are the most important for any dog. It is during these weeks that the parts of the brain that will forever control interactions with people and other animals are formed. That is why is it is so important to ensure your puppy has frequent, positive experiences with other dogs and people of all ages. One of the best ways to provide a structured training environment while experiencing consistent socialization is to enroll your new pet in puppy classes. Here at Franklin Falls, we have puppy classes for puppies age 8 to 16 weeks run by a certified behavioral trainer. Classes meet at the clinic and focus on confidence building, beginning obedience training, socialization, and preventing unwanted behaviors. 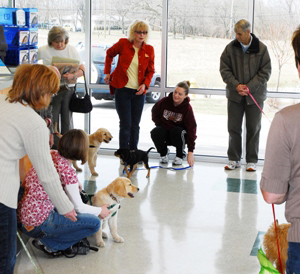 If you are interested in enrolling your puppy in class, please give us a call at (317) 859-0252. Trixie all snuggled up after surgery!